Although the age of the engine is unknown it is likely to be a late 90's model. Serviced each year with receipts. Regularly sailed the sails are in serviceable condition. This Longbow has only had two owners over 32 years and clearly has been well looked after. She is very spacious for a 31 footer, at a good price and still regularly sailed. Designed by Laurent Giles, and introduced in 1972, the Westerly Longbow is a solid fin keel cruiser. The same hull moulding was also used with a centre cockpit deck to produce ketch-rigged versions. Over a thousand of the various versions were produced, of which about 260 were Longbows. Other models using the same hull are the Westerly Berwick, with sloop rig and bilge keels, the Pentland, with centre cockpit, ketch rig and bilge keels, and the Renown, with centre cockpit, ketch rig and fin keel. 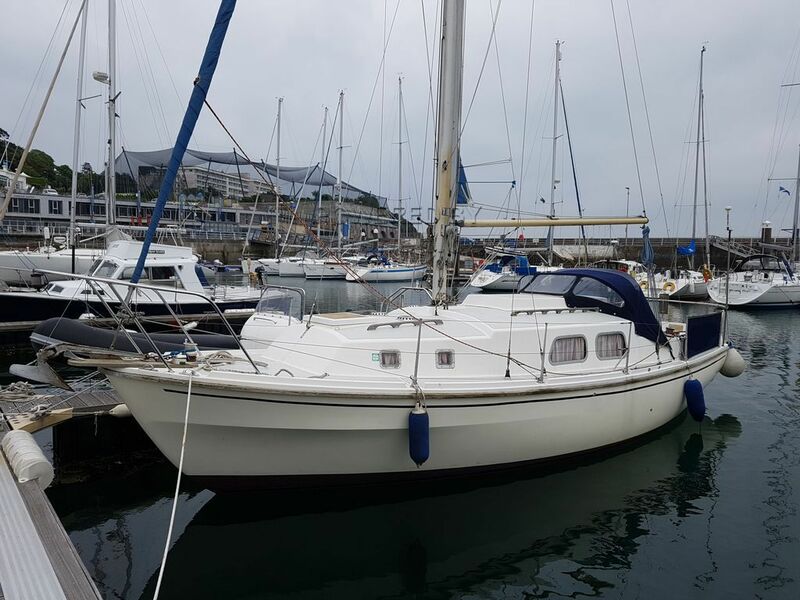 This Westerly Longbow 31 has been personally photographed and viewed by Phil Key of Boatshed Torquay. Click here for contact details.